Graveyard cake or wicked fingers. So why the pull you ask? Well . . . do I make something that I like, or something my sweet half likes. Orange frosting . . . mmmmm . . . well, just for Halloween! Orange rolls for him . . . Orange frosting for me. Truly Orange rolls to die for! I have to admit, I was a bit saddened that I had ruined my beautiful Orange rolls & Cinnamon rolls. Bright Orange frosting, Black Sparkle gel and sprinkles. They somehow morphed into this! These puppies are a lot of work. Normally, I can stand back and be proud of the end result. These are just ugly . . . Booish but ugly! They still taste really good though! I figured that sprinkles would help pretty them up . . . it didn’t help. 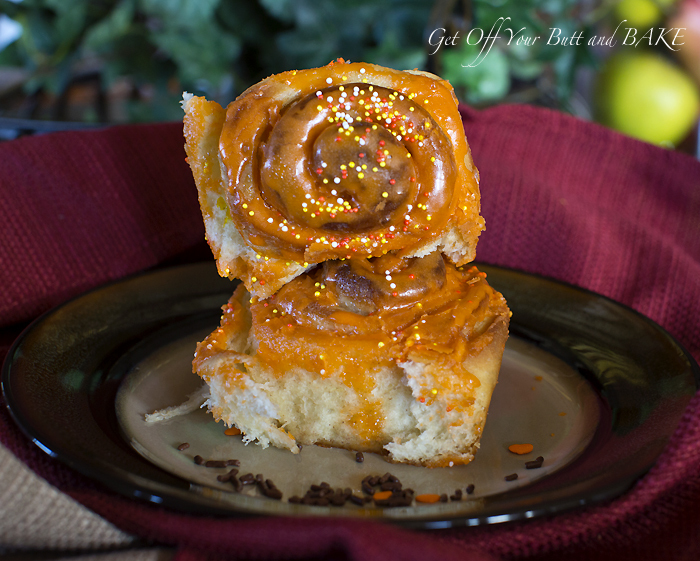 You can use the same “Orange rolls to die for” dough, and make Orange rolls or Cinnamon rolls. A while back, I gave you the full tutorial on making these yummy rolls. Here are just a few highlights on the process – roll up your sleeves, cuz it takes a while. If it’s still dark in your kitchen . . . turn the lights on. Let it rise to beautiful heights. It helps to assemble all your tools before you start. I like to 3 X’s the recipe, so that I can run them around to friends and also put a couple pans in the freezer. So . . . I will Roll 3 different times. My oblong circle is large! It’s a good 1/4″ thick. If you want to make gooey Cinnamon rolls with the optional raisins, melt a cube of butter. Remember . . . my circle is large . . . I used almost the full stick of melted butter. Srinkle a good healthy dose of good quality Cinnamon over the butter. SPICES INC has excellent Saigon Cinnamon and lots of other great seasonings & spices. I love their Manzanillo Mexican Seasoning. It’s good on everything! Well, maybe not on Orange rolls and Cinnamon rolls. Sprinkle an enormous amount of Brown Sugar over all that melted butter. Drop a few raisins on the top . . . only if you like raisins though. You could sprinkle nuts over that glorious brown sugar if you like. My hubbie wouldn’t touch them though! If you are making the Orange rolls, simply spread the delicious butter, sugar and Orange rind mixture over the dough. Remember . . . for the full recipe and tutorial click below. ORANGE ROLLS TO DIE FOR! My better half . . . is a coconut fanatic, so I sprinkle coconut over the top as well. Oh . 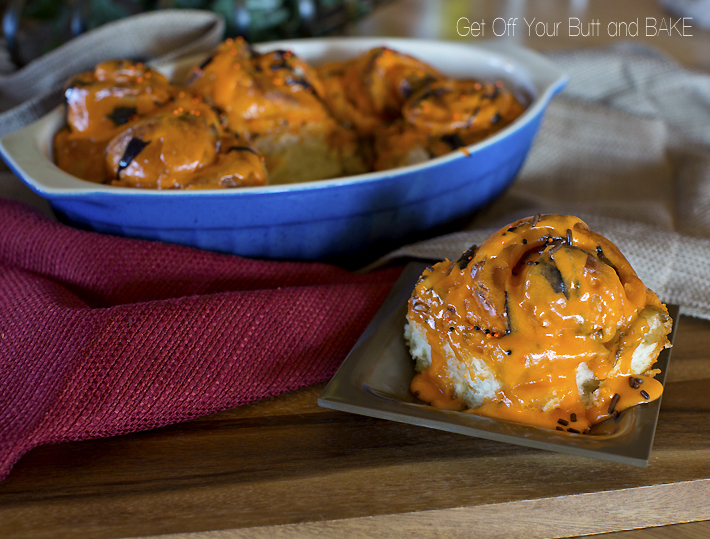 . . glorious Orange Rolls! Roll that long roll of dough . . . up and over. So that you don’t just roll all that butter, right out the door! I swear, using a piece of string to cut the rolls at least 1″ thick . . still works the best! Place them in your greased pans. I – 3 X’s the recipe and got 5 pans of rolls. The pan above is larger than 9×13. In the other 4 pans – 9×13 . . .I put 3 rolls across and 5 down. Cover them with a clean kitchen towel, and let them rise until they are double in size. Just look around your house, you’ll find some sun somewhere! My spot . . . just so happened to be at my front door! I usually put them in front of the fire place, but it was 70 degrees outside. I really can’t tell you how long they will take to rise . . . it depends on how warm your house is. If you’re in a huge hurry, preheat your oven to the lowest possible temperature. That is probably 150 to 170 degrees F.
Once the oven is at temp, TURN THE OVEN OFF! OFF! Lay clean towels across the racks, and place your towel covered pans on the towel covered racks. Let them rise beautifully in the oven until they are double in size. while the rolls start rising . . . you MUST clean your kitchen! When they are ready to bake, preheat your oven to 350 degrees F.
Place one pan in the oven at a time. I usually place the pan in the center of the oven. Make sure that the bottom of the rolls are golden as well, before you take them out of the oven. I Place the pan on the bottom rack for a few minutes . . . it works every time. Oh . . . so good . . . worth the effort good! I always cute with string! I never have good results when I use a knife or other cutting device.